Undeserved thrill is how I would characterize my sentiments towards this follow up to the inaugural issue of my column. If you are new to this column, please consider reading the first installment to facilitate a proper introduction to what is to follow. The first one lays out plainly the underlying philosophy that this column is about. 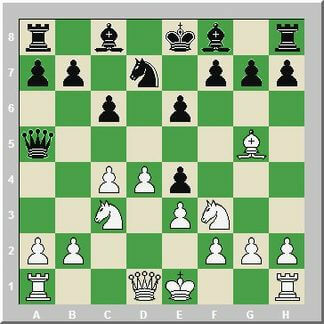 This blog entry was first published as the second installment of a series on Tactics Theory for my column, "The Whites of Their Eyes" at www.chessville.com. With regards to the first installment of this column, unsolicited but generous lauds I received from readers were very encouraging. The picturesque title suggested by the publisher and wisely seconded by my editor correctly enunciates the underlying tenor of the column. I am thankful for their wise guidance and empowering charge. Their passion for chess and their consequent promotion of chess knowledge deserve our utmost admiration. In this forum, I invite readers to join me in the quest for chess improvement at any age. Please send any comments, questions and suggestions regarding this column to the publisher. They are most highly desired. Do not hesitate to share your personal struggles either from the application of your own system of chess thinking or from the amalgamation of systems including the one championed by this writer. If you decide to give my system a try and as a positive outcome you see some qualified success in your play, please tell me so we can give it due mention in future editions. In our last discussion, I alluded to the nature and scope of the subsequent topics. However, other promising ideas with regards to the direction of this column are being considered. Since the column is not constrained by space, expect to see wide use of multiple diagrams and illustrations for the sake of clarity. Understandably, my own games afford me unequaled utility so most game examples will be mine. Besides, I can only testify to the efficacy of the system from my own experience. As an extra benefit, I can be harsh in my criticism without offending anyone else. In future issues, I will write about almost anything that touches the gamut of chess improvement and the human drama behind it. In the meantime, I thought I should complete the intended series on “tactics theory.” A noted writer named Howard Goldowsky, through an email exchange, brought the phrase to my attention. The phrase conveys my musings on the topic in a fortuitous way. I am sure he does not mind my borrowing it for inclusion here. The number of books and articles written on opening theory indeed abounds. The appetite for it is insatiable. Our wanton indulgence, it seems, leaves us gorging on the wrong kind of food. Just like the fat in one’s diet, it tastes good but is downright harmful. The benefit is temporary but the damage is lasting. We consume it far more than we do equally important facets of the game like tactics, middlegame strategy and endgame techniques. The lack of variety leads to lingering indigestion. Our quick victories in the opening give rise to our misplaced devotion to opening novelties and their dedicated study as a way to attain sustainable growth in chess. Did we not hear the sage declaration that “all openings are playable below master level? One only has to examine his or her own library to find corroborating proof to this assertion. I, myself have irrationally spent large sums of money years back hoarding books on openings I do not even play. Shrewd marketing, I say. I guess I bought them because I wanted to learn these openings and make them part of my repertoire. Many are collecting dust not deserving even a casual perusal. For that matter, I have books I have yet to read from cover to cover. For the record, I will only mention books in this column that have benefited me. I will not recommend work I have not read or studied. My hope is to save you money and time by extolling only flavorful books that dish out much needed calories minus the fat. Lately, I only buy general works on chess by notable authors like Aagard and Watson. Presently, my discriminating preference is beholden to eBooks openings. My purchasing habits nowadays are influenced by my desire to narrow my repertoire to mainline systems because of their solid reputations.But enough digression already and let’s get to serious business which is tactics theory. I know for certain that every player wishes to improve both in knowledge and skill, and this is even truer among master level circles. With the desired improvement, as evidenced by rating, is the pressing need to eradicate blunders or simply diminish errors in one’s game. For the sake of framing our discussion in the proper context, let’s classify errors by the magnitude of their impact on the outcome of the game. But first note that the word blunder by definition is a gross error. In most cases, as our experience attests, one blunder is enough to decide a game. However, some moves, which cannot be classified as blunders by our definition, should be labeled as errors because at the time they were played, better alternatives existed. The playing of an inferior move in our construct is an error just the same. These particular errors are survivable as single events and have lesser impact in the final outcome of the game. If not corrected, however, the cumulative effects of these errors can be fatal. We will put a spotlight on these error types in our next discussion when we consider how the system can be used to spot tactical opportunities and exploit combination motifs due to errors by our opponents. Even the incorrect sequence of moves (transposing moves) can be termed as error. In practice, it is only the presence of a large advantage that keeps the win uncompromised despite the error. Nevertheless, we want to eliminate even this type of error because we aim for near perfection. As a practical matter, continually missing opportunities can be a big letdown leading to dire consequences. In our quest for chess improvement, failing to exploit a winning opportunity is equally to be avoided as playing a blunder. It is not enough to simply prevent our own blunders, because winning requires obviously much more. We must be just as alert in exploiting weaknesses and blunders of the opposing side. Both abilities must be honed to attain the desired lasting chess improvement. This reminds me of Purdy’s influential work on my chess thinking entitled “The Search for Chess Perfection.” The reader is best served if he dutifully reads said book in one week, spending at least one hour per day on the material. This particular book justly deserves a cover-to-cover treatment. A disheartening example of a missed opportunity is my only duel against FIDE Master Dennis Strenzwilk at the National Open, Las Vegas, 1994. In the diagram below, it is White to move. How should White continue? See if you can find the best move faster without using my system. Later, come back to the position but this time carefully applying the system step by step. See if the best move is found a little faster. After 27 moves, we get the position shown above. This is a critical point in the game and I should have taken more time before continuing. Without doing proper reconnaissance of the new position, I continued with the plan formed earlier. Always invest the time to update the plan as the last move played usually changes the battle terrain. Failing to do so may lead to missing better opportunities on the board. On my next move, I played Bxf5 and stood ready to accept Black’s resignation. Instead, a defiant reply appeared on the board in Rxf5. The move sent a chill up my spine and both ears started to feel awfully warm from the rushing blood. I slowly realized that I had chosen the wrong continuation. When winning opportunities are missed, we often have to expend valuable energies dealing with the damage to the playing psyche. But you should always take the time to settle the jarring effect to the mind. Otherwise, the continuing moves will be fired as from a disturbed and hazy gun scope. Using the system and asking the key question: “Do I have something better that is more forcing than the one I am about to play?” I would have seen that Rd7 was a better alternative and would win on the spot as Black has no viable defense to the threat against the bishop on g7. If Black defends it with …Rg7, then Bxf5 and the mate threat on h7 is unstoppable. One other defense for Black is to interpose the knight on e7, but the problem here is that the move would leave the queen on b6 en prise. Because I did not use the system, I chose a less forcing move and wrongly executed the sequence. The sudden turn of events was such a big emotional letdown, that it caused me to treat a slightly advantageous position like a lost position. In three moves, my game transformed from a won game into a lost game. The mind, unwilling to accept the drastic change in fortunes, rejected a bailout that would preserve the slight advantage and instead played a blunder which turned the tables in Black’s favor. I recklessly avoided the exchange of queens on f7 and played Qgd3, which promptly elicited the crushing reply Nce5. See diagram below. At this point, I was in a daze and resigned the game in disgust after a couple more moves. Let’s return to our discussion on types of errors with the first category that I simply call “major errors” and which we aptly nicknamed “blunders.” This error type usually results in the loss of material that can heavily tilt the outcome, of course, in favor of the player who gained material. Bear in mind though that not all material deficits will necessarily lead to imminent loss. The inverse is also true. Not all material advantages guarantee the holder the imminent win. Alas, chess is not easy. That is why we love this game so much. How do we prevent these errors from cropping up? Is it even possible to all but eliminate blunders? The answer is a resounding yes! The solution I boldly propose is a formalized system of chess thinking. This system is claimed to be formalized because the agent or practitioner is disallowed to vary from the process steps. It is described as a process because it is limited to a series of steps which are sequential in order. Bypassing a step is dangerous and renders the system devoid of its intrinsic distinction as a process. In other words, all the steps must be observed and followed at all times in all conditions during play. By the way, regardless of varying chess abilities, we all employ some kind of chess thinking before arriving at the chosen move. Some of us have a good and consistent move selection algorithm mirroring the kind employed in chess programming. The avowed system shares the same robust characteristics. For those who are looking for a reliable system, this is a boon to you. For the system to be effective, one must apply it consistently without digression, at every turn to move, in all phases of the game (opening, middlegame and ending). One has to only note that it takes just one of these types of errors to tilt the balance of the contest to a consequential result. Consistency, which means uniform application of the system for the entire duration of the game, is the key. Do not fault the system if it delivers inconsistent results for you because of laziness and failure to consistently apply it to your play. Only strict compliance augurs promising results. The same can be said of those Process Improvement Systems in manufacturing designed to limit variance (error) in output. What sorts of “thinking actions” are involved in this process? The easiest way to explain this notion is by way of game fragments such as the following. But first, let’s outline the steps. 1. Initiate a broad reconnaissance of the position to gather key data elements. Key questions: Which piece or pieces are undefended? Which squares are weak? Is my king position safe? Is the opponent's king safer than mine? Which piece is undeveloped? Which piece needs repositioning? Which piece is lacking escape squares if threatened? What are the imbalances on the board? 2. Search for specific threats. Key questions: What are the threats? What is the last move threatening? 3. Rank the severity of the threats. Key questions: Is the threat real or valid? If the threat is real, can I ignore it? Can I nullify the threat by my own threat? 4. Focus your response against the threat with the highest degree of harm if ignored or not prevented. Key question: Which threat is the most harmful if not prevented? 5. Search for candidate moves. Key questions: Which candidate move best responds to the threat? Does this move, if executed, create even more serious threats? 6. Execute the move in your head. Key questions: How does the move alter the position on the board? Does the piece chosen to move currently perform a vital function? What happens if the function is no longer performed as a result of the move? What structural changes occurred because of the move? 7. Conduct a post-reconnaissance of the position after the chosen candidate move is mentally executed. 8. If reconnaissance yields a bigger harm as a result of the move, repeat step 6 and 7 until a safe (correct) move is derived. Over time, the process steps become abbreviated in their execution details as you gain mastery of the entire sequence. As you improve, you will know when to shorten or even skip a step, but for now try to consistently apply the process in its entirety. Your own results will tell you when the time has come that you can vary from it. Remember that our primary concern here is the elimination of game-ending blunders. I say that because the same system can be used in finding game-winning tactical opportunities (combinations) for you. We will eventually develop a general system approach where we combine the system with other general planning and strategic principles which will guide our entire thinking during the prosecution of the entire game. Elemental to chess improvement is a background understanding of some things in chess theory. So, the following is a necessary digression and a repetition of some concepts discussed above. This is by design. I want us to preface every juncture in the discussion, if possible, with old knowledge thereby reinforcing our understanding of the key parts while cementing our overall grasp of the subject matter as a whole. There are two types of errors, namely, errors of omission and errors of commission. Examples of the former occur when we fail to notice a tactical opportunity leading to a huge advantage on the board. A somewhat common variety of this error involves choosing a move resulting in a slower win than a much quicker one. For the sake of chess perfection, the error, while still winning, can be termed a minor error of omission. Errors of omission are simply the types that fail to execute the best move from among the available legal alternatives. The focus in this installment is the latter type of error that I call errors of commission. These are the errors we commit on the board brought about by gross oversight, chess blindness, and miscalculations. This genre of errors is almost always tactical in nature and decisive in impact. The byproduct of these errors is either material loss or outright resignation. Obviously, we can skip the application of the system in the early moves of the opening as contact is usually minimal during this phase for most openings. However, there are certain openings requiring the application of the system as early as move three. The system has some implicit assumptions. One such assumption is knowing when to invoke the system. If you are certain that you are playing book lines, then you can save time by skipping the system. As soon as contact between pawns or pieces is initiated or the divide in territory is crossed though, it is prudent to invoke the system at once. Be alert to invoke the system also when the opponent makes a long move outside the safe confines of its territorial control like Qa5 in the following example. Over time, you will develop a feel for when to invoke the system. This happens when you achieve some degree of efficiency in its use. One other situation to watch out is when you observe a move not so well-regarded by theory. There are concrete reasons why some opening moves are not included as theory. While the system can be and should be applied in all phases of the game, it is only the timing or the “when” to invoke the system that varies. Our first example invokes the system in the opening phase of the game. By the way, the process steps must be verbalized in the head. Hearing your mind talk clarifies the steps, cements options, and ensures none of the steps are bypassed. When I say critical, I mean White is already presented with options requiring apt decisions. Options on the board, as we said earlier, mean opportunities for errors. A general piece of advice to remember is to choose continuations offering the other side an array of possible responses, especially if the line proves unfamiliar to the other side. A player familiar with playing against the Cambridge Springs usually has a preferred response against the main lines. The preferred response, borne out of the player’s experience, leads to positions he is comfortable playing against. We know that familiar positions elicit feelings of safety and confidence in the conduct of one’s play. Decisive play is usually indicative of optimistic chances. In over the board contest of wills, the role of the psyche cannot be diminished. The one who believes that he is winning or has the better position generally seeks, and as a result naturally finds, the best moves. But it is my contention that finding the best move (avoiding tactical blunders and exploiting tactical combinations) will get much easier with the system. Step 1: Initiate a broad reconnaissance of the position. One will observe that White up to this point has followed sound book lines. Black’s last move defines the Cambridge Springs Defense. There is contact between the c4-pawn and the d5-pawn. The black knight on f6 is attacked by the bishop on g5. 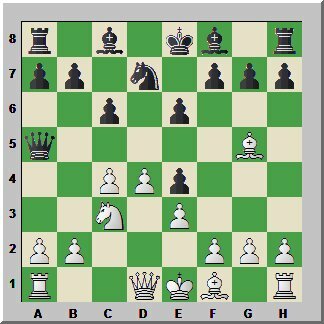 The bishop on g5 is only supported by the knight on f3. Curiously, the Black queen just left its original square, a move normally frowned upon by opening theorists. The knight on c3 is pinned to the king. Step 2: Search for threats. What are the threats? What is the previous move threatening or attacking? Which threat is immediate? Which ones are delayed? With the move …Qa5, what is the queen threatening or attacking? The answer is usually long and descriptive like so: “The queen on a5 attacks along its path directly and indirectly, the knight on c3, the king on e1, the pawn on a2, the rook on a1, and the bishop on g5.” In some cases, the attacked elements are not just pieces but include the squares along the path of control. While it is true that some of the pieces on the path of control are only indirectly attacked, there are variations where even these pieces are in danger of capture. Keeping that thought in mind during play will save you some headaches. Step 3: Rank the severity of the threats. Is the threat real or valid? If the threat is real, can I ignore it? Can I nullify the threat by my own threat? Can I ignore the threat? If the threat is against the king, you must momentarily pause your own activity and mitigate against the threat first.Threats against the king are fatal. 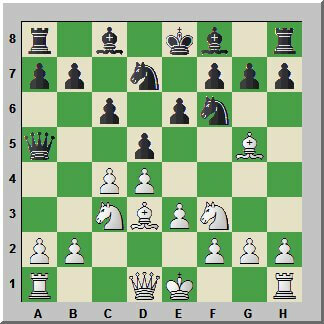 n this instance the threat is not against the king, but directly against the knight on c3 and indirectly against the bishop on g5. Can I counter with a bigger threat? You look for undefended pieces. You look for overloaded pieces. Overloaded pieces are pieces fulfilling multiple functions such as defending another piece, defending a pawn or pawns, and defending a key square. You look for pieces with limited escape squares. Look for pieces which are on the same color square. These pieces are vulnerable to forks and skewers. White has no threat of his own and, therefore, cannot counter with a bigger threat. Since White has no counter threat, and he cannot ignore the threat, he must now proceed to step four. Step 4: Focus your response against the threat with the highest degree of harm if ignored or not prevented. 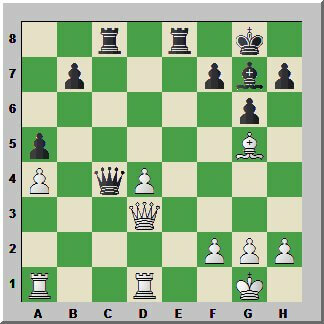 Seeing the threats, White will recognize that the knight on c3, if attacked by another piece, will lead to the loss of a pawn if left undefended. Since the knight is pinned to the king, the square it occupies, in a sense, is also under attack. The obvious piece that can establish contact in one move with the square is the black knight on f6. Knowing this, White should consider preventing the knight from reaching the attacking point. The threat against the knight on c3 is real and cannot be ignored. Step 5: Search for candidate moves. Which candidate move best responds to the threat? Does this move if executed create even more serious threats? Never examine candidate moves until the threat elimination steps have been completed. It is simply a waste of time. Most blunders occur when threats are not noticed. They are not found because there was no active search in the first place. Start with the moves that protect against the direct threat, which is against the knight on c3. One way of protecting the knight is to stop another hostile piece from directly attacking it. 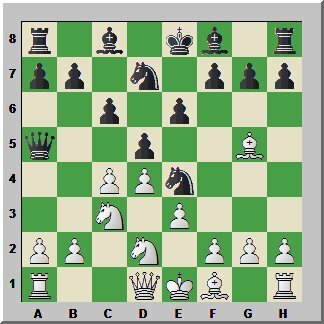 In this example, the obvious piece is the knight on f6 landing on e4. White can capture it with the bishop but that only temporarily stops the intrusion on e4. In fact, this is called a loss of tempo since it brings the other black knight on d7 to f6 in a recapture. The threat of this knight landing on e4 is renewed. Another option is to defend the knight on c3 with Rc1. This option leaves the a2 pawn undefended though. Another option for White is to defend the e4 square with a bishop by Bd3. 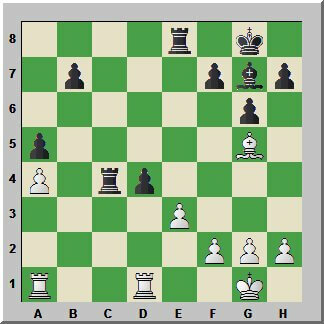 White’s idea is to capture the knight landing on e4 with the bishop. This looks correct and seems a natural move because it develops a piece and prepares castling. Analysis: Position after White plays 7.Bd3 to defend the e4-square. But we cannot know yet for sure if indeed this is the right move until the rest of the steps are carried out. Step 6: Execute the move in your head. How does the move alter the position on the board? Does the piece chosen to move currently perform a vital function? What happens if the function is no longer performed as a result of the move? What structural changes on the board occurred because of the move? This helps in seeing what happens when a move is chosen and executed.Imagine the move played on the board. This may be difficult at first but becomes easier over time. Force yourself into doing this each time. Ask also if the pawn now advanced to the next rank can be defended or not. Defend pawns with other pawns if possible. Avoid defending a pawn with pieces unless the loss of the pawn will seriously compromise the king’s safety. Ditch the pawn if defending it hampers the activity of your pieces. Step 7: Conduct a post-reconnaissance of the position after the chosen candidate move is mentally executed. Also, consider the structural changes that occur after the move is executed, especially with pawn moves. A vacated square is open for occupation by other pieces. It can serve as a jumping point for other pieces en route to the opponent’s king. 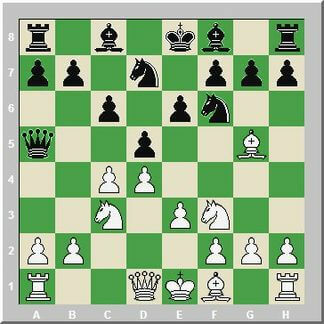 If one examines the resulting structural changes after the recapture by Black on e4 with the pawn (see diagram above), it will be noticed that the knight on f3 is now attacked by the recapturing pawn on e4. The other change that is hard to notice without purposeful examination is that now the queen on a5 directly attacks the bishop on g5 because the pawn on d5 that blocks the queen’s attack path has moved to e4. What you get is a double attack that is winning for Black on the spot. Double attacks almost always win material as one is limited to one move each turn and the right to move is then ceded to the other side. Step 8: If reconnaissance yields a bigger harm as a result of the move, repeat step 6 and 7 until a safe (correct) move is derived. Since the chosen response against the threat does not “adequately” prevent the intrusion of the knight on e4, and because capturing the knight with the bishop on d3 is a blunder, we dismiss Bd3 as a suitable candidate. The system helped us see that the intended follow up to our candidate move is a blunder. So, we go back to step number six. The second look for candidate moves yields Nfd2 (see above diagram) as a plausible choice. This move protects the e4 square and unpins the other knight on c3. If Black continues with …Ne4, White will simply capture with the knight on d2. When Black recaptures with the pawn on d5, the pawn is no longer attacking anything on f3 (see diagram below). White can then take the time to save the bishop from the queen’s attack. A knight has been exchanged for a knight, an even trade. Meanwhile, the Black pawn on e4 is overextended and will need protection. Black’s control of d5 is also diminished, which can be detrimental to him in some lines. The threat is prevented and yields no harm to us, so we choose this candidate move. We can then safely conclude that the best move against the threat is finally derived. We will dissect in much detail the last two steps in the next installment. There, we will attempt to make all these elements cohere in a game from start to finish. The last two steps also perform useful functions in general planning or positional play. In the above diagram, Aronian is White and the Black side is Svidler. White has just taken a pawn on d3 and is now attacking Black’s queen on c4, offering the exchange of queens. Black correctly delayed the exchange and played …c5xd4 supporting the queen with the rook on c8. You can rightly assume that both players are constantly doing a general reconnaissance of the position before and after every move. Black saw the immediate threat to his queen which motivated the pawn capture on d4 in reply. With the move, Black has given White options and we know options can be a source for error because one has to calculate the consequences for each candidate option. With a forced reply, your choice is usually limited to one. For ill or for good, you have to make the move. Let us take the White side and employ the system to decide our next move. Let us assume that we have been continually updating our reconnaissance data. We know the general terrain. We see that presently, Black is ahead by a pawn. So, we have to figure out a way to restore the material balance. We are aware of all the contact points. We are also aware that the Black bishop on g7 is directly attacking the rook on a1 and so forth. Do we have a forcing reply that will give us an advantage? The answer is no. Taking the queen first on c4 is a forcing reply, but it will only bring another heavy piece to c4 attacking d4. Let us not straight away dismiss this reply because it is not clear upon cursory examination if that really matters. If you are following carefully, we are now on step three. We now continue with the system and search for all threats, mentally noting the degree of harm of each threat if left ignored or not prevented. Do we have a threat that nullifies Black’s threat? The answer again is no. Can we ignore his threat or threats? The answer once more is no. Now, we search for candidate replies starting with the biggest threat. Let us say that the biggest threat is the simultaneous one against the pawn on e3 and the rook on a1, which will be exposed to capture by the black bishop after …dxe3. Let’s look at the reply, e3xd4. First, what structural change did the move create in our position. Answer: The file is now open and only one rook is controlling the file - not ours but Black’s. The pawn on d4 is now White’s not Black’s. The threat to the rook on a1 is practically eliminated because it is presently blocked by the pawn. So far, these are the obvious changes to the position. One other observation that is of concern to us is that the material balance is for now restored. If we are alert, we will notice that the enemy rook controlling the open file now has access to our back rank and can give check to the White king. Well, we already know that all checks must be attended to. The rules of chess force us to first parry the check by any means before making another legal move. It is akin to losing a turn at bat. After a careful examination, we will find that a check on e1 can only be parried by capturing the checking piece with our own. The only piece that can legally do it is the rook on d1. Here, we finally see the real danger: the rook on d1 performs a crucial defensive role supporting the queen on d3. The tactic is called deflection or overloading a function. 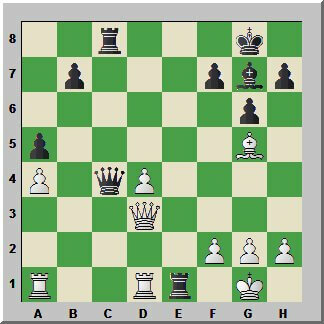 Suddenly, White’s rook on d1 is forced to perform two functions: the defense of the queen on d3 and the defense against a check on the king. Black forcibly deflects the rook on d1 from the defense of the queen on d3. We now see that the pawn recapture on e3xd4 is a gross blunder. We successfully avoided it and now we continue to search for other candidate replies with the least harm. In the actual game even a world class player like Aronian blundered with e3xd4, and Svidler got to play Re1+ so White resigned. We limited our discussion in this issue to the employment of the system in preventing errors of commission. The next installment will focus primarily on the successful employment of the system in preventing errors of omission. We will also briefly discuss combination motifs and when to look for them on the board. Suffice it to say for now that errors of omission are usually survivable, whereas errors of commission are generally fatal. Therefore, more care has to be given to its handling, and preventing such errors should be our biggest concern in the first order. If we can just eliminate these errors, quick and ego-bruising defeats will be far fewer and between. When this is finally achieved in your game, the jousting experience becomes satisfying and rewarding.